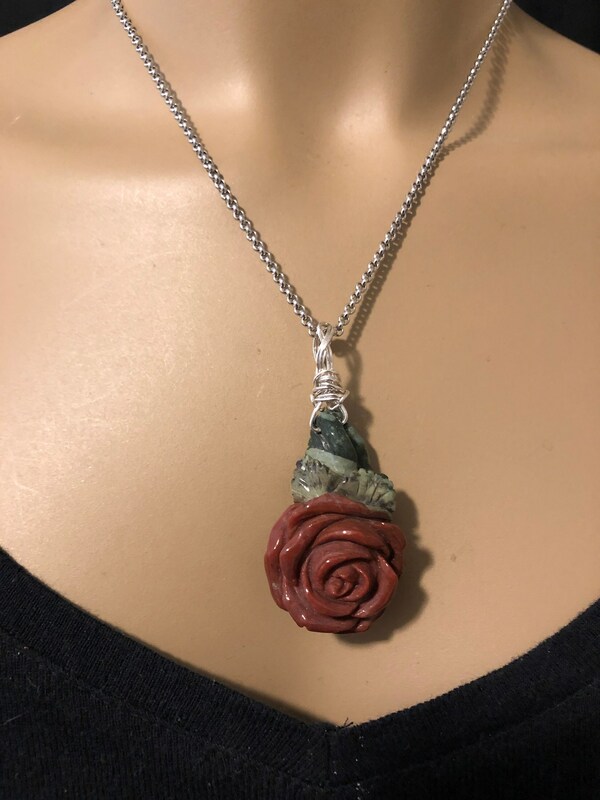 This beautiful hand carved rose is carved from a piece of red and green jasper. It has incredible detail and is polished as well. I made the bail with Sterling and it hangs from a sterling chain. The pendant, including the bail is 2.25" x 1". And the chain is 18" long. The unique artistry of Jasper is that of Nature itself - golden sunshine, a nighttime sky, poppy fields or a deep green forest, desert sands, the undulating ocean, red rock canyons, sweeping mountains. Each stone is a masterpiece of the Creator, bold and primitive in style, solid and earthy in form, with a warm, harmonious energy that resonates with the primal self. There is a wide variety of Jaspers, characterized by color, form, and similarities to places or animals found in nature. Many are named for the regions where they are mined; others are named by those who discovered them. Though far too extensive to cover here, we will mention a few of the more popular and familiar Jaspers, some with their own pages and additional metaphysical properties. Multi-colored Jasper carries the properties of its dominant color, or colors, while still drawing energies from its subtle hues. Red Jasper is red to terracotta brown, sometimes mixed with other minerals. 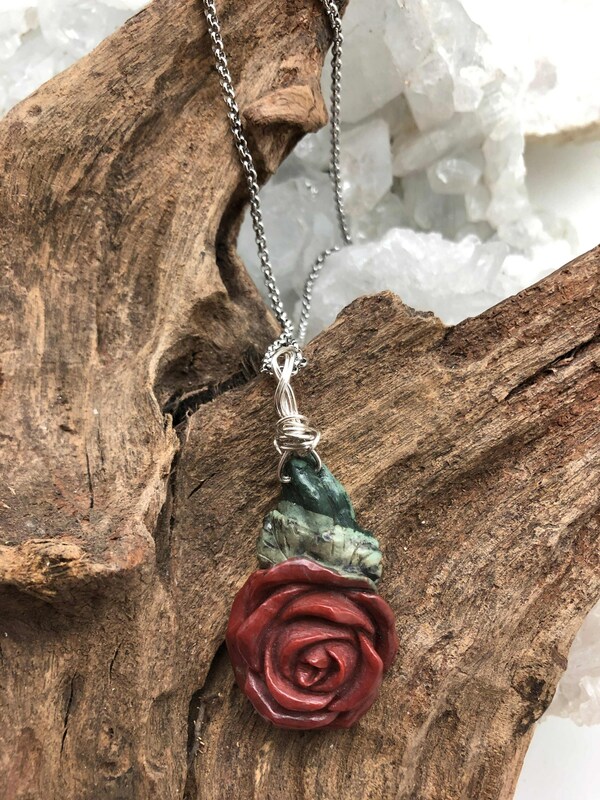 A stone of physical strength and energy, Red Jasper stimulates gently and steadily, enhancing stamina and endurance, and increasing the amount of chi, or life force, in one’s aura. It is a stone of health and passion, and brings the courage to face unpleasant tasks and to rectify unjust situations. 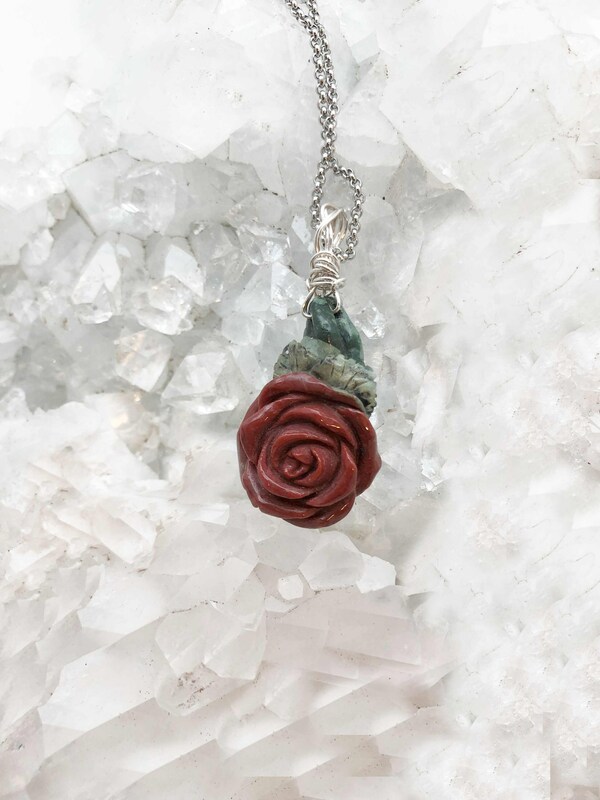 It provides vivid dream recall, and is a powerful stone for those who work with Earth energies to make a deep connection with Earth spirits and guardians of the leys and sacred sites. My shipping may be higher than others, but I insure each piece I send and that costs more to send.